I don't have a sweet tooth but I liked it! The bitter taste of Matcha green tea gives an elegant flavor to the chocolate. You can dip in any kind of sweet treats, snacks, or whatever you like! 1. Place Matcha in a small bowl. Add soy milk little by little and mix until smooth. 2. 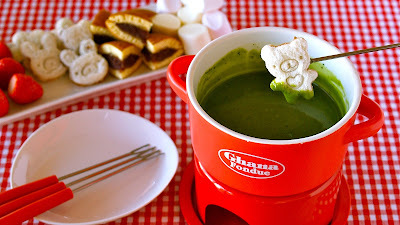 Heat Matcha milk in a small pot or a fondue pot.